An assortment of 3 of our most popular premium loose teas. Each tea represents our passion for an extraordinary tea drinking experience. Our family has been dedicated to exploring and blending teas for over 160 years. Our journey began in Moscow in 1849, where Klonimus Wissotzsky opened his business and became the exclusive tear purveyor to the Russian Emperor. As our company grew, we traveled to the tea gardens of the world to source the finest whole leaf teas, creating exceptional blends that have earned numerous awards from connoisseurs of Europe and Asia. 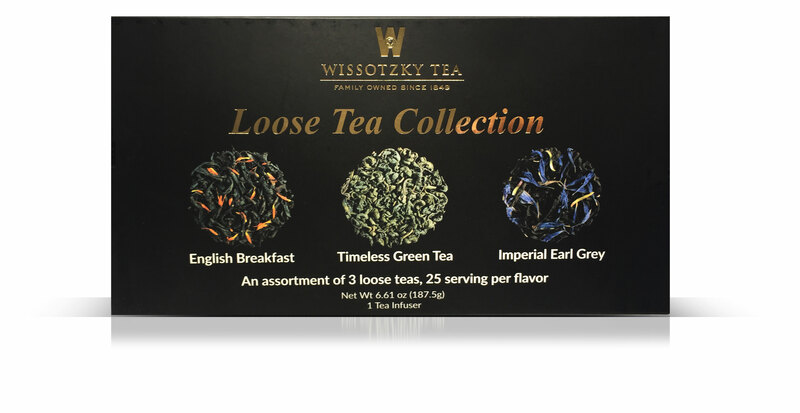 We are proud to introduce Wissotzsky Tea to discerning tea drinkers all over the world. This Tea Collection of Imperial Grey, English Breakfast and Timeless Green Tea represents the very best of our family journey. We hope you’ll enjoy drinking our teas as much as we loving making it for you. 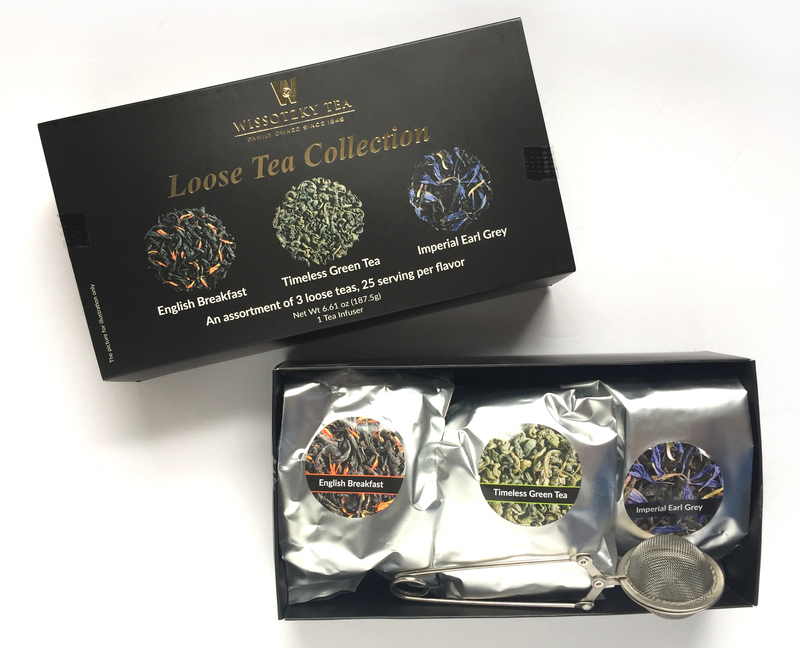 Wissotzsky Tea Loose Tea Collection is beautifully packaged in a classy black box which makes a lovely gift for any tea lover. Imperial Grey 2.20 oz/ 62.5g/ 25 Servings: Ingredients - Selected Ceylon Tea, Cornflower Blossom and Bergamot Flavor. English Breakfast 2.20 oz/ 62.5g/ 25 Servings: Ingredients - Selected Ceylon Tea, Selected Assam Tea, Safflower Blossom. Timeless Green Tea 2.20 oz/ 62.5g/ 25 Servings: Ingredients - Green Tea.